Day One of Sundance offers the one, momentary chance for empty shuttle busses; the calm before the deluge of media, film industry professionals and movie fans. It is also a chance to witness Park City ski culture before the Sundance hordes take over and make the winter resort town their own. From what I see outside the shops on historic Main Street, treating one’s dog more like a person is status quo for style conscious skiers. 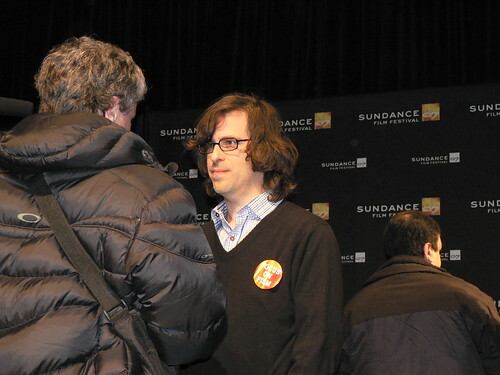 Just after the opening day press conference, held at the Egyptian Theatre with “Chicago 10” director Brett Morgen (pictured above), a dog follows behind his owner sporting bright red booties on his four legs. The owner’s point is that his dog shouldn’t have to suffer cold paws, or basically live like a dog. Later, exiting the New Frontier On Main exhibition area, the festival’s debut spot for film art installations and the latest filmmaking equipment, a woman approaches the front doors pushing a large stroller. I quickly step aside and open the door, impressed by the stamina of anyone capable of navigating Sundance with twins at their side. But there were no babies in the stroller; just two tiny dogs bundled up in blankets. If this woman has children, my guess is that the dogs get first dibs on the stroller. Press check-in on the first day of the Sundance Film Festival means long lines for unlucky journalists whose credential photos were lost by the festival computer server and quick sign ups for those whose photos remained intact. (I am happy to report that I avoided the long photo line, although I am sympathetic about computer malfunctions after recently replacing a frazzled laptop). Inside the second-floor press lounge at the Park City Marriott, where everyone huddles over a computer, actor-turned filmmaker Steve Buscemi sits alone at a table, adjusts his wire-frame glasses and studies his screening list. A few colleagues stop and say hello, offering their pledge to catch his adaptation of controversial Dutch filmmaker Theo Van Gogh’s “Interview” on Saturday. But for the most part, people walk by Buscemi without notice or choose to leave him alone. Instead, the spotlight belongs to the Blockbuster Total Access Girls – a squad of pretty corporate cheerleaders straight out of the Detroit Auto Show. 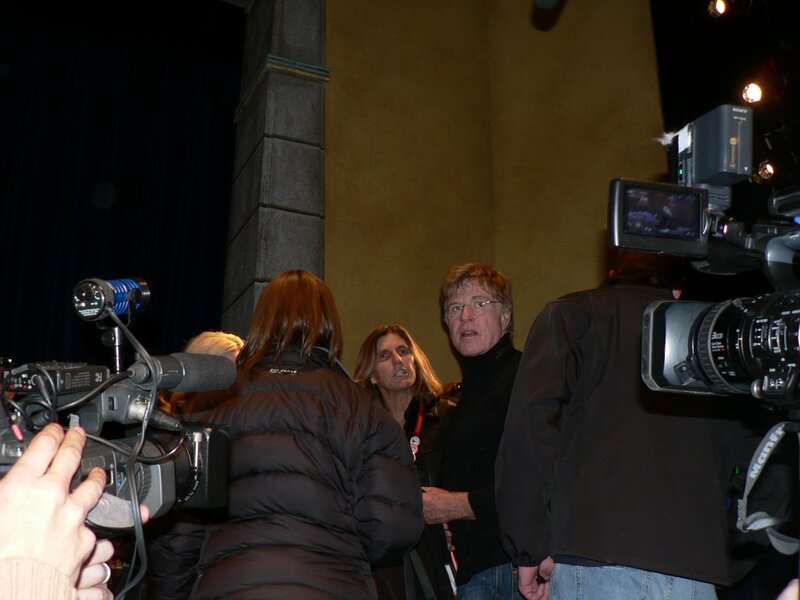 Yet, these smiling women are at Sundance, proof of what Robert Redford said later at the opening press conference (pictured above), that like it or not, fashion and promotion of new goods has become part of the Sundance experience. Buscemi doesn’t stand a chance against the Blockbuster posse with their beige thigh-high boots, white parkas with the Blockbuster Total Access logo, white tights and plenty of sass. His lonely guy experience is a page from Buscemi’s nerd performance in “Ghost World.” Nobody wants to pay attention to an unassuming middle-aged filmmaker and actor no matter how acclaimed he might be. There are babes to meet and photograph, for some people, a key part of the Sundance experience.